A small space exploration game where, captain of a small ship, you are tasked to get your crew back home, to earth. Perils and opportunities await you on your journey, good luck, adventurer! For the space section, I created a plane, and then added a script that would cycle through an array of textures, and rotate the plane to a random amount to make the same "Starfield" texture feel different even if encountered two times in a row. The planet is using a modified version of the Retro Planets asset (free), I added the ability to randomise radius, colour and shading, in addition to this, I created a point light in front of the ship and made the light to be the same color of the planet's (so it looks like the planet is emitting light, I think it looks nice). The ship is made out of models I got some time ago during a sale, the package is Sci-Fi designer, for whomever's intrested. Finally, on top of everything is a pixelator Post Screen Shader, to make everything consistently at 64 by 64 pixels, as required by the jam. Today I focused on transitioning, jumping between a planet and the other. I took an animation heavy approach: although there is some new code, most of the heavy lifting was done by mechanim this time. I added a UI as well, mostly non operational, but pressing the JUMP button will allow you to witness how cool I managed to make the transitions look, YAY! If you happen to have a good idea on transitions between space backdrops let me know, cause the current way relies on fade out/in, and it's not making me crazy happy. Enjoy the new demo, this time also for Mac, and stay tuned for updates! I decided to work on planet generation to a data level and crew management: what this means is that now planets have a name, a colonising race and a government type, these values are pretty much window dressing, for immersion, but they also have a resources availability amount. This is calculated when the visual representation of the planet is generated, the bigger the planet, the higher the amount of resources. 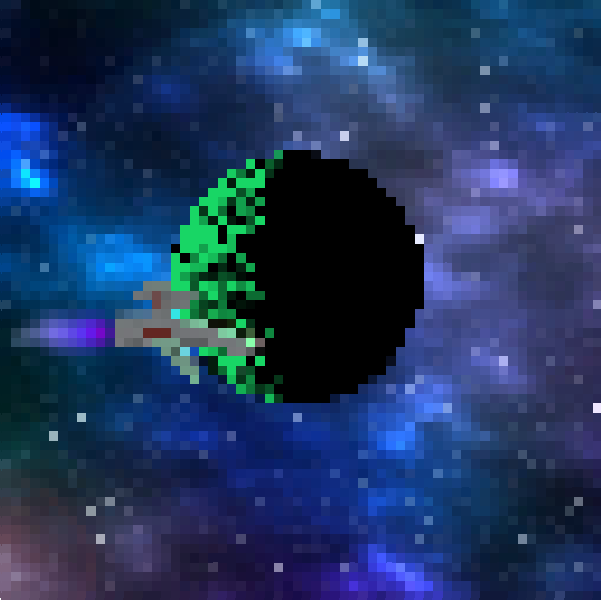 The ship has now a crew of randomly generated individuals: they have different names and start with different moods. If you keep them fed, they will be happy, if you let them starve, they will eventually mutiny, it's up to you, the captain, to keep a healthy crew, before they decide to come and get you! Should you decide to be a feared captain though, you can get those mutineers and eject them from the ship, the rest of the crew will not complain about the food for a couple of jumps, but be careful, a crewless ship does not go far. you can find it HERE!!! DevLog 4: Still on this! so, the LowRezJam is finished on the 14th and I didn't have a game. Had to work and focus on Uni, since I have two major deliverables in a few days and an exam next week. DevLog 5: PLENTY OF STUFF!!! Even though I have not been updating for a while, I have been working a lot on the game! Resources are now tracked, and generated based on the planet size: a big planet will have more resources, therefore will sell them for less. Each planet has a market that is currently functional. Unfortunately there is no demo this time, since the features are not connected in a proper way and the mutiny algorithm is expecting a main menu scene that still does not exist, I promise a new demo will be up in the next 2 days. See you guys at the next update!! !